Farmers in the Nyaungliebin District of Karen State say the combination of severe weather that destroyed most of their crops and an out-of-control Burma Army stealing their foodstocks and livestock means many people now face starvation. Chamu reports. Villagers in Mone Township, Nyaungliebin District, Karen State, from both the lowland and the highland areas, are facing food scarcity. Unseasonable rains during the dry months have destroyed crops while soldiers from the Burmese army pillaged livestock and food supplies from villagers. This is partly a result of the Burma Army’s ‘Four Cuts’ policy, developed in the 1970s to weaken ethnic armed resistance by cutting off their access to funds, information, recruits and food. Farming is the major source of food and revenue for villagers in Mone Township. Those who do not have their own farms, or equipment to use on other peoples’ farms, have to rely on subsistence farming and work for as little as 1500 kyat ($1.50) a day. This work relies on the seasonal weather. In the rainy season villagers tend their paddy farms and in the usually dry summer months they grow beans and fish. They sell their surplus at local markets. Bad weather can cause food shortages and financial woes. This year during the dry season the lowland area experienced unusual long and sustained periods of rain. Bean crops that normally grow in summer perished in the wet conditions. Since 2010 farmers from Ta Khaw Bwar and Wai Soai villages have only been able to harvest 30% of the rice from their paddy farms – the other seventy percent was destroyed by the unseasonable weather. The unexpected early rains are also causing problems for mountain farmers. Villagers depend on trees from the forest to create terrace farms. This is a traditional farming method where lumber is collected in April, dried and then burned in May in order to make the forest ground fertile for the planting of crops. Step farms are vital to local communities as they allow villagers to grow not only paddy rice, but other vegetables as well – cucumbers, chilli, gourds, long beans and pumpkins. This year, the trees were to wet. A villager explained. Bad weather is not that is threatening villagers of Mone Township’s. The Burma Army units in the area pillage livestock, fish and grain. The soldiers extort whatever they can from villagers. Villagers cannot do anything and are scared of the soldiers. In early 2011, villagers traveling to work on their bean farm have to carry limited rations of rice, fish paste and cooking oil. Villagers are scared that if the Burma Army see them with more they accuse them of supplying rations to Karen National Liberation Army (KNLA) soldiers. 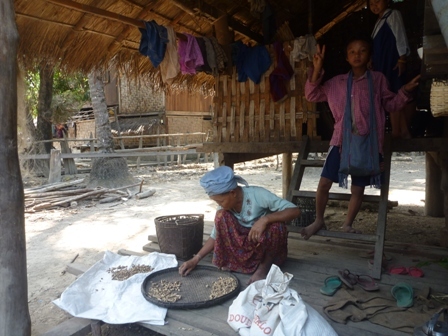 Villagers are also ordered to send rations to the Burma Army camp. Soldiers sent a message to the village chairperson ordering him to come and meet them and their commander. The Burmese soldiers interrogated the village chairperson about the rations. They then went back to the village and searched a villager’s tent and found supplies which were deemed to be in excess. The soldiers beat him, threatened him with a gun and destroyed his kitchen. The villagers who live in the high region in Mone Township also face difficulties due to the fighting between the Burma Army and ethnic armed groups. The Burm Army based in area use the fighting as a pretext to oppress the villagers. They accuse villagers of giving information and supplies to the rebels. The soldiers enter the villages and take animals and rice to eat, and extort money through the village chairmen. In early 2011, the War Office in Naypyidaw initiated a new phase of the ‘Four Cuts’ with an extra ‘cut’ aimed at breaking communication links. This is specifically targeted at the ethnic armies which have refused to sign up to the Burmese government’s Border Guard Force initiative. Saw Friday, a Burma Issues field worker was in Mone Township on a fact-finding trip to collect information on post-election human rights violations. Saw Friday says villagers he met were in poor condition condition. Climate predictions indicate the problem is going to get worse. Oxfam, the famine relief charity based in the United Kingdom, recently warned that crop prices could rise by 120 – 180 percent by the year 2030. For villagers in Mone Township it is a vicious cycle. A repeat of the unseasonable rain prevents farmers from growing crops, which denies them the revenue they need to buy rice and vegetables. Without being able to sell and grow crops for their own sustenance, the future for the people of Mone Township is precarious.